It is a summer day at the Raptor Trust, and the convoy of SUVs begins. From each emerges a mother and child, or children, holding a box. In the box is an injured bird, or abandoned baby birds. 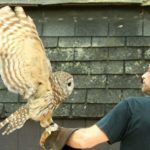 “If we had a pair of shoes for every shoe box that came in, we’d put Imelda Marcos to shame,” says Chris Soucy, the director of the bird hospital and rehabilitation center his father built. It’s not because there are more birds out; it’s because more kids are out. In the box brought in by Riley Korzeneski, 10, and her friends Paige Carbone, 10, and Emmagrace Pachkowski, 9, was a grackle fledgling they found flapping in their neighborhood in Cranford. 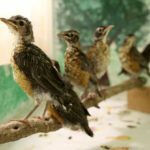 Last year, Riley and her two older brothers, Jack and Tommy, found a bird that had been attacked by a hawk on the ground near the pond at Union County College. They were there fishing but stopped to rescue the bird and brought it to the Raptor Trust in a box. 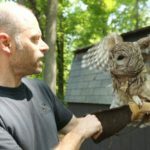 The Raptor Trust, which is on White Bridge Road in Millington and surrounded on three sides by the Great Swamp National Wildlife Refuge, is a nonprofit corporation with yearly operating expenses of about $663,000, with a paid staff of about 20, and a volunteer corps of 80. 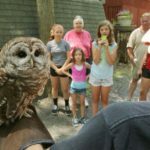 It is supported by donations from some of the biggest names in New Jersey foundations (Kean, Frelinghuysen, Duke Farms) and corporations (Prudential, Johnson & Johnson), right down to like-minded local Audubon societies, wildlife refuges and garden clubs. And it all began 46 years ago with “a couple of birds in a box,” Chris Soucy said, nursed back to health by his father, Len, who died June 11 at age 82. The memorial service for him is Saturday at 1 p.m. at the Dorothy Young Center for the Arts at Drew in Madison, and a fund has been set up in his name. Len Soucy was a baseball prospect at Bloomfield High, and an Army drill sergeant during Korea, and a tool-and-die maker. He studied gems and minerals, crafted jewelry and loved country and bluegrass music, but was especially drawn to birds of prey. Len Soucy bought 14 acres in the swamp-side woods in Millington on a street with few neighbors. The first cage ever built still stands behind the family home, all plywood and two-by-fours, with a corrugated plastic roof and chicken wire and netting to keep the birds in and predators out. 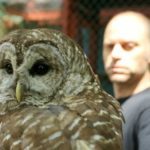 “That was the early ‘hawk and owl’ cage,” Soucy said. Then word spread, and then came more boxes, and more and more cages. “It was very informal at first,” Soucy said. “My father and his friends would get a case of Schaefer, tell dirty jokes and build the cages. 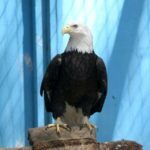 Now there is a hospital, where surgery is also done, an education center, a gift shop, and dozens of cages filled with all kinds of birds; vultures, ravens, falcons, owls and the garden variety that people brought in boxes. Some of the birds are longtime residents, incapable of being released into the wild. The stars are the two bald eagles; a male with an unrepairable wing, and a large female who is majestically perfect in her wings and body. 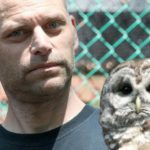 Chris Soucy has not spent his life at the Raptor Trust. He left home after graduating from college in 1988 and taught school in three states. He was a touring musician, playing guitar and bass at venues across the country. He got married and settled in Colorado, had some music-related businesses, and his wife, Jessica, ran a riding academy and owned six horses. But it is. 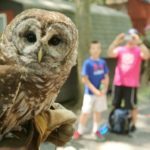 He came back last year to take over, and help his father finish a book on New Jersey hawks, a companion to his book on the state owls. And now he has inherited his father’s legacy. “He taught people to have compassion for all living things,” Soucy said. And that legacy shows up, dozens of times a day in summer, in all those children who bring in the boxes.